Talking Dogs blog and For Love of a Dog Jewelry. 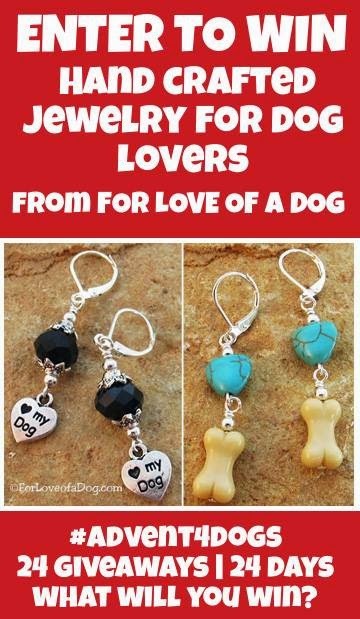 For Love of a Dog Jewelry earrings plus so much more in the FitDog Friday 2nd Anniversary giveaway! 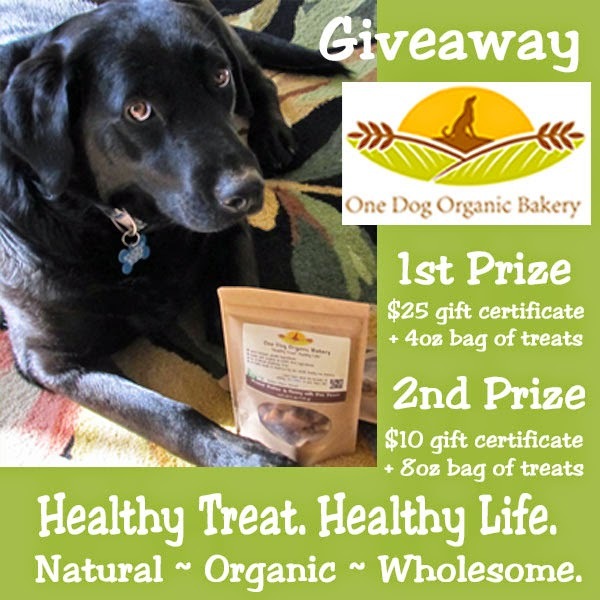 One Dog Organic dog treats giveaway! Ended Feb 16. Congratulations to Kate Volz and Christine Aiello! 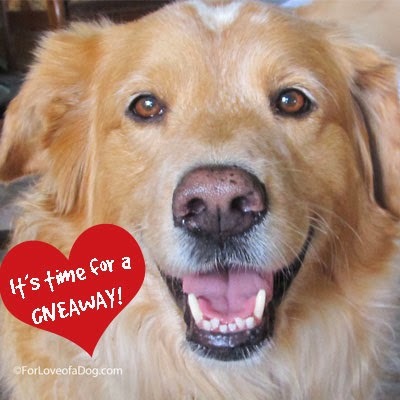 #Advent4Dogs Giveaway hosted by Kol’s Notes, Dogthusiast, Heart Like a Dog, NEPA Pets and Wag’n’Woof Pets. Ended. 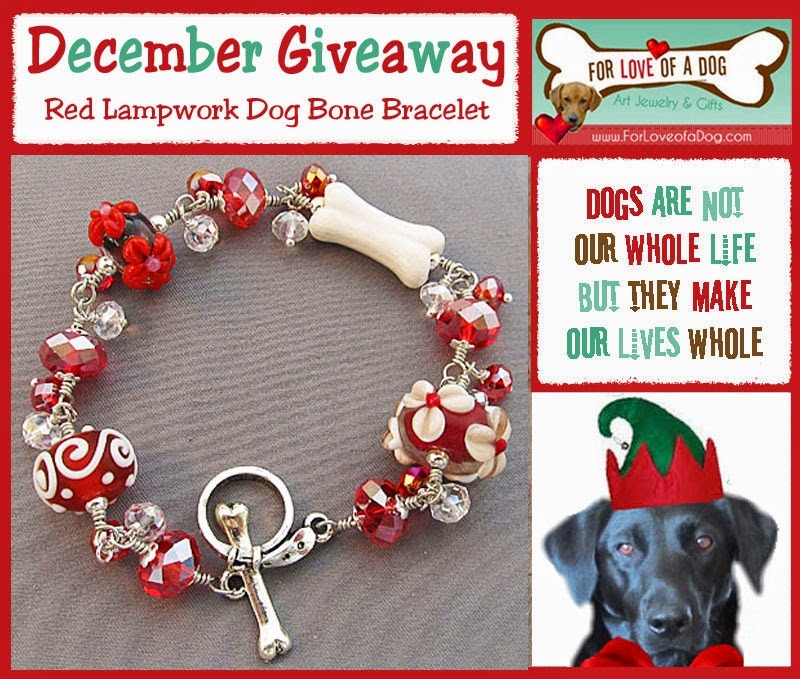 Enter the December Giveaway of For Love of a Dog Jewelry to win this dog bone bracelet. Giveaway ended December 12. Congratulations Jennifer! 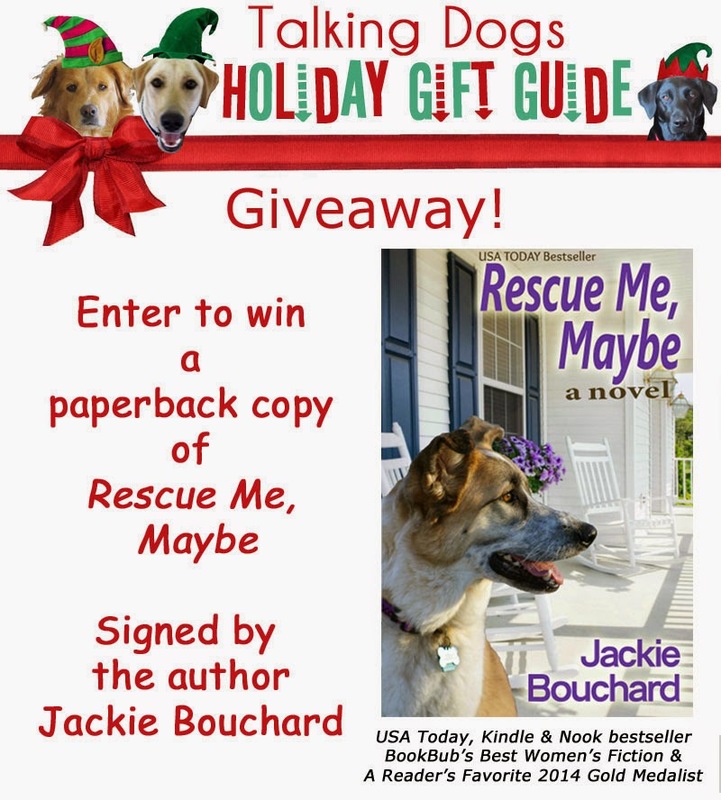 Enter to win a copy of the book Rescue Me, Maybe signed by the author Jackie Bouchard. Giveaway ended December 8. Congratulations Ashley! 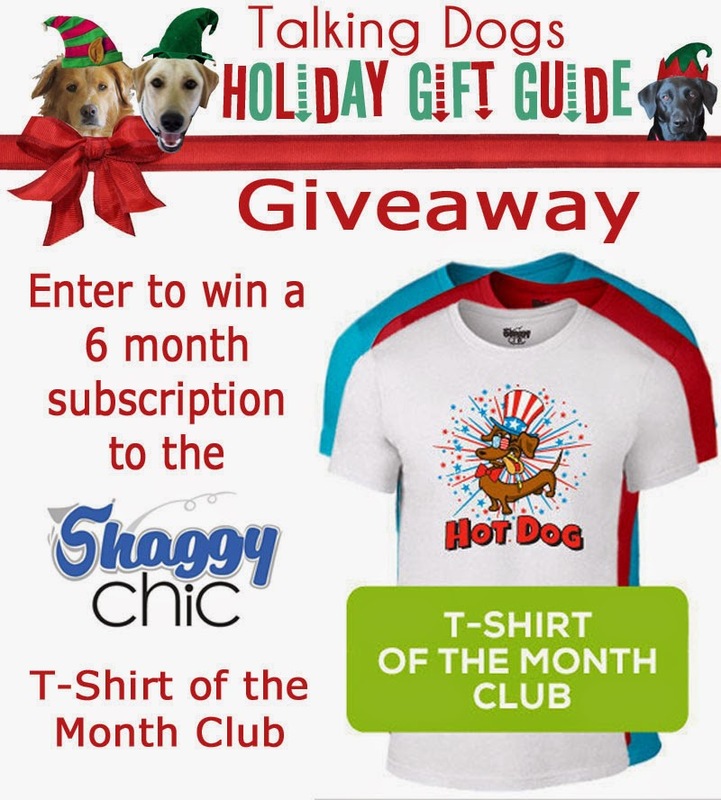 Enter our Holiday Gift Guide for Dogs and Dog Lovers Giveaway to win a 6 month subscription to Shaggy Chic T-Shirt of the Month Club. Giveaway ended December 3. Congratulations to Becky! Southern States Rescued Rottweilers - SSRR - is having a Christmas Auction from November 15 - 29 to raise funds for the medical needs of the Rotties in their foster program (current and future). 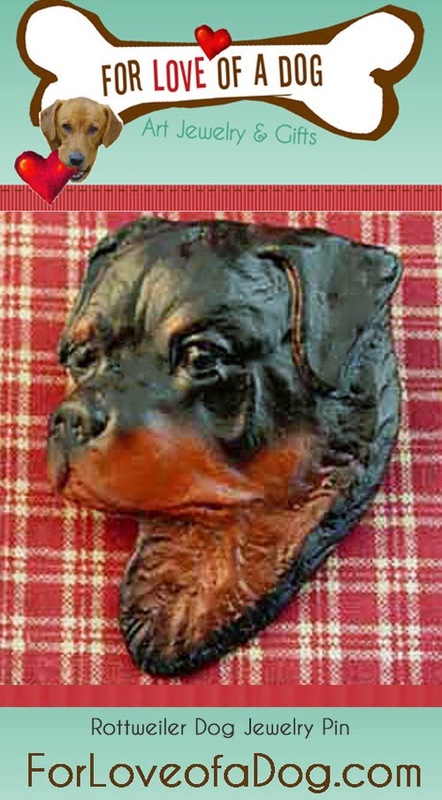 Bid to win a Rottweiler dog pin from For Love of a Dog Jewelry. You'll find the auction event here. Auction ended Nov 29. 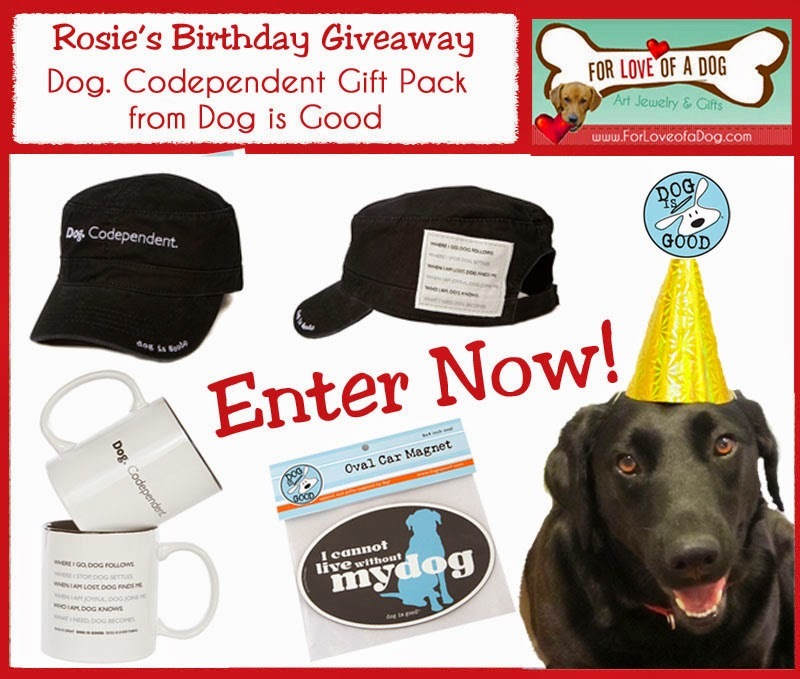 Enter Rosie's Birthday Giveaway - a Dog Codependent Gift Pack from Dog is Good will be in November! Ended Nov 17. Congratulations to Jackie Bouchard! 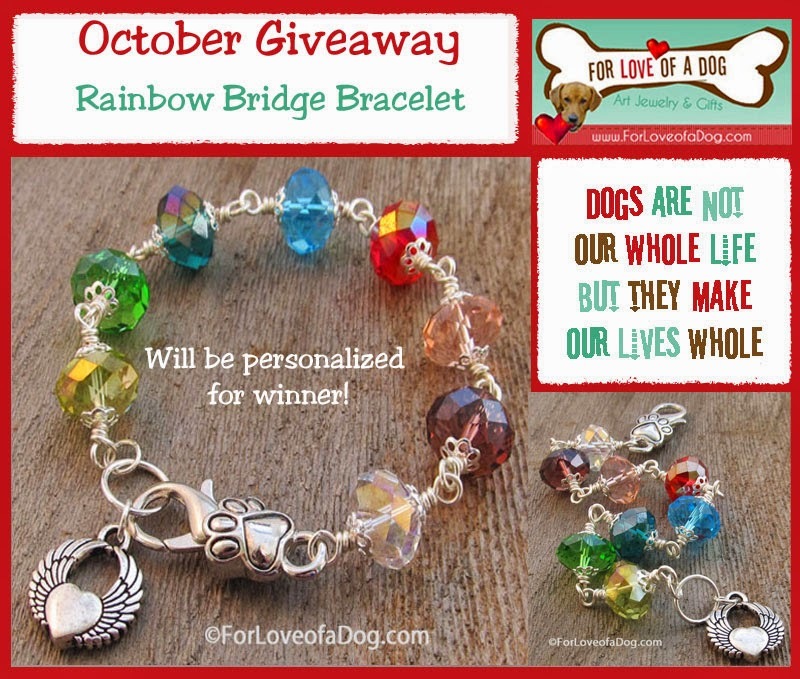 Enter to win a personalized Rainbow Bridge pet memorial bracelet for dog and/or cat lovers in the For Love of a Dog Jewelry October Giveaway! Ended October 30. Congratulations to Terry Toby! 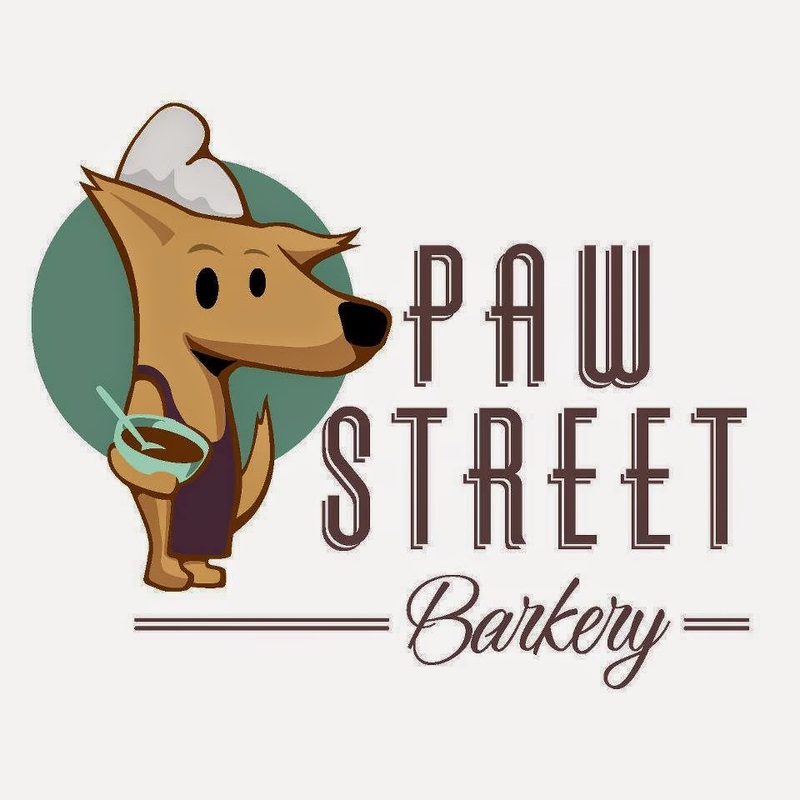 Enter to win a Paw Street Barkery $25 Gift Certificate for some tasty gourmet organic dog treats! Ended October 28. Congratulations to Jason Diehl! 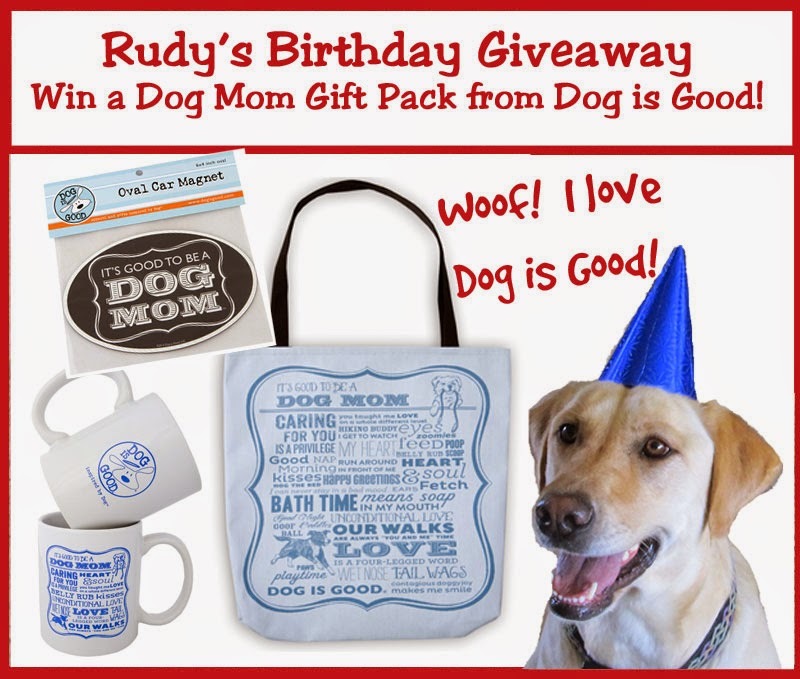 Enter to win a Dog Mom Gift Pack from Dog is Good in Rudy's Birthday Giveaway! Ended Oct 17. Congratulations to Liz Bismore! 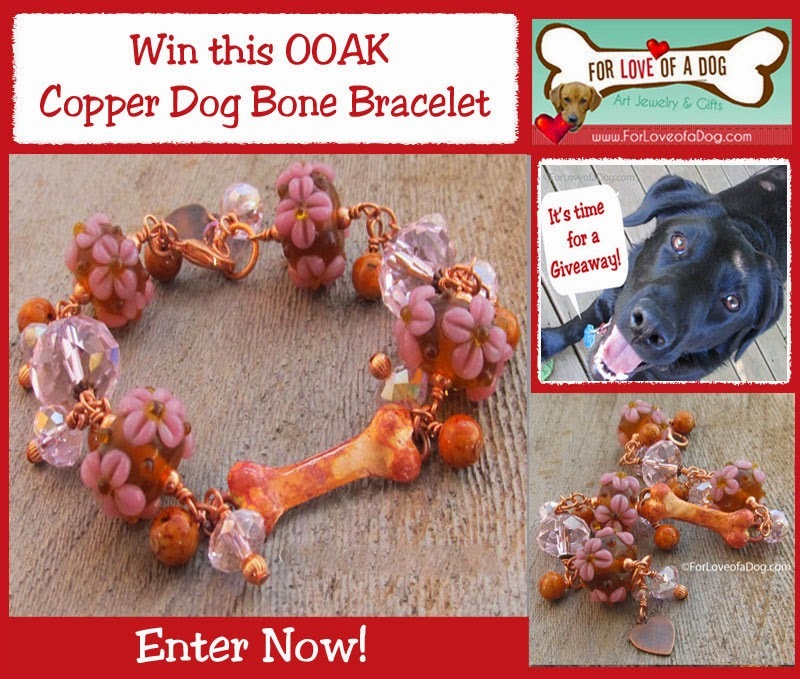 Enter to win this OOAK Copper Dog Bone Bracelet from For Love of a Dog. 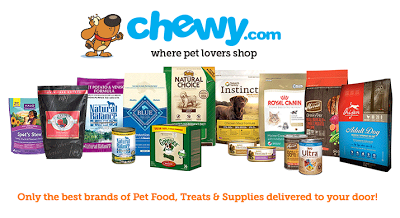 Our September #giveaway ended Sept 30. Congratulations to Melissa Clinton! 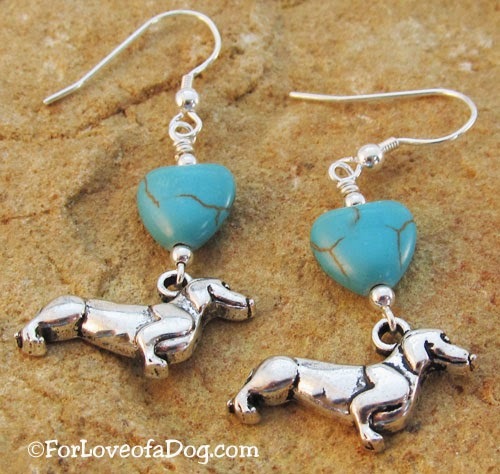 For Love of a Dog silver and turquoise Dachshund dog earrings at Dolly the Doxie's Blogversary giveaway ended. Congratulations to De Cunningham! 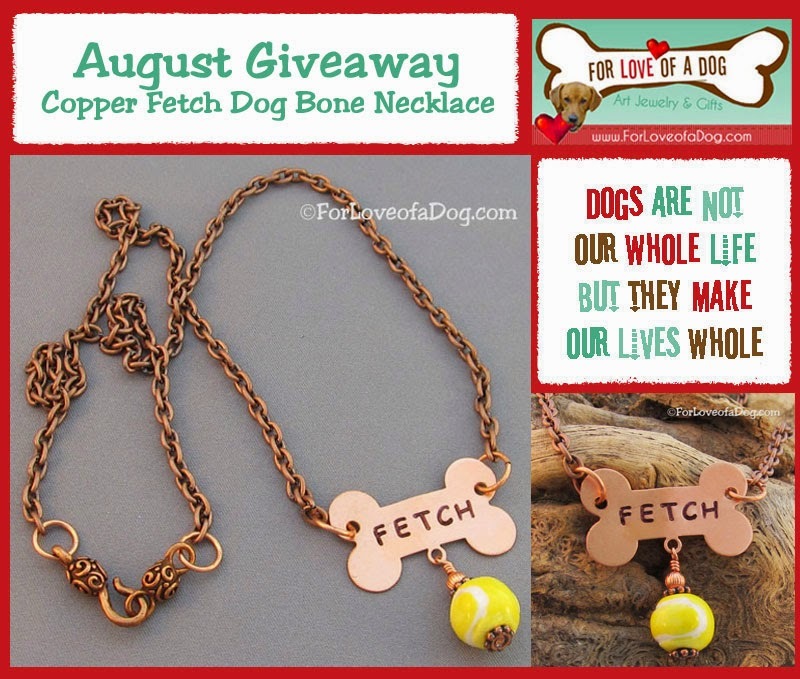 Win this copper Fetch Dog Bone Necklace from For Love of a Dog. August giveaway ended at midnight August 27. Congratulations Rachael! 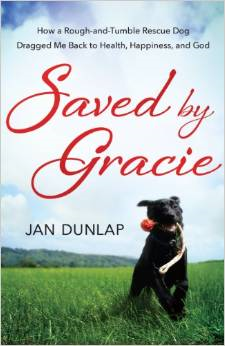 Win a copy of Saved by Gracie the inspirational dog book by Jan Dunlap. Giveaway ended Aug 14. Congratulations to Stacey and JoAnn! 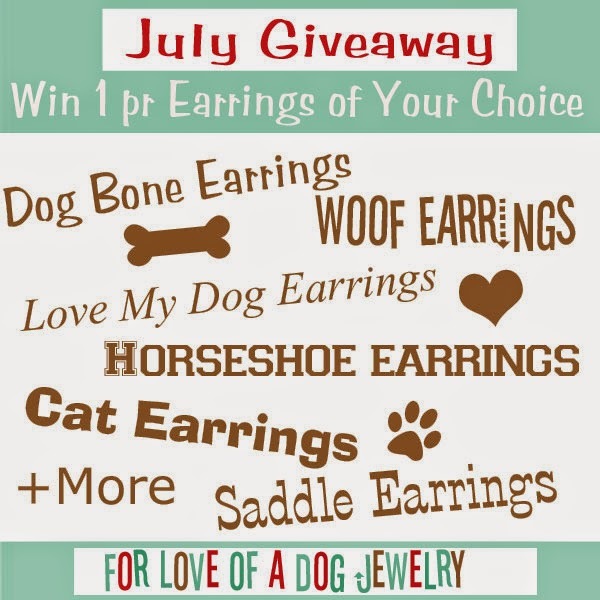 One (1) pair of dog, cat, or horse themed earrings - For Love of a Dog July Giveaway begins July 21 and ended July 30. 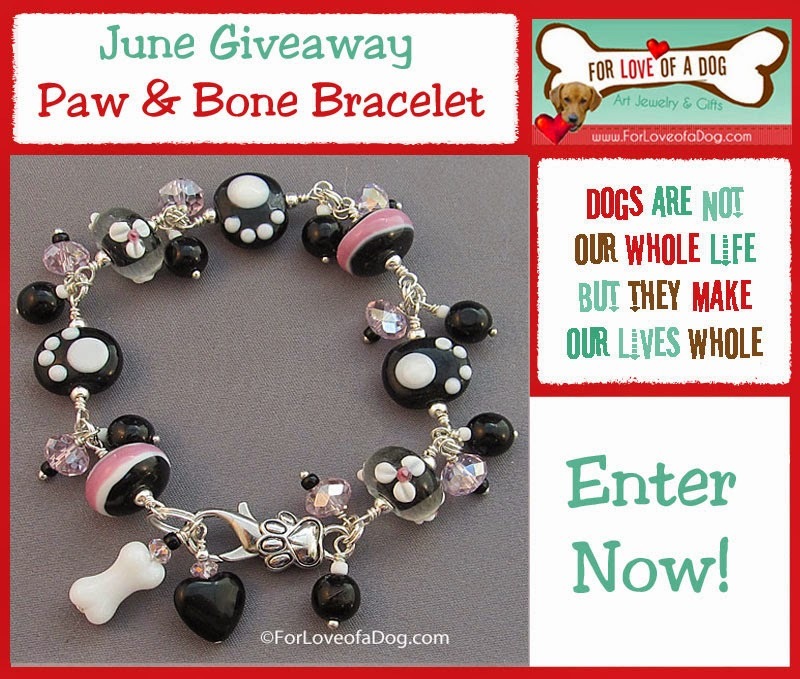 Congratulations to Linda S.
OOAK Paw and Dog Bone Bracelet - For Love of a Dog June Giveaway begins June 16. Ended. Congratulations to Bethany! 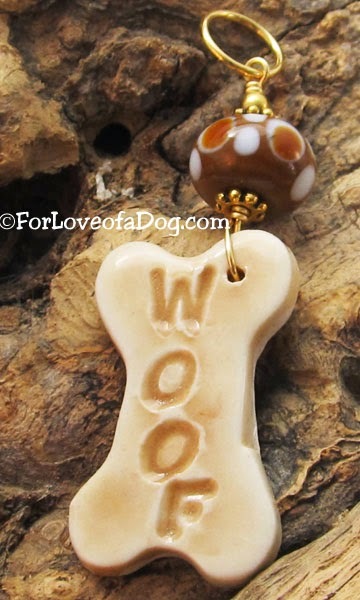 Woof Dog Bone Pendant from For Love of a Dog Jewelry - K9 Kamp Giveaway begins June 27 and ends 7/16/2014. Congratulations to Jan! 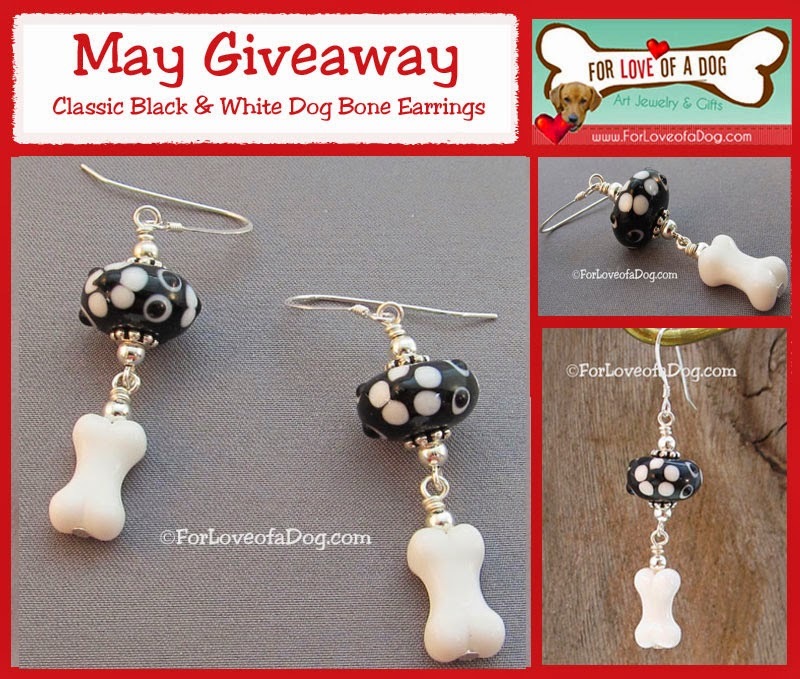 Dog Bone Earrings - For Love of a Dog Jewelry May Giveaway! Congratulations to M.K. Clinton! 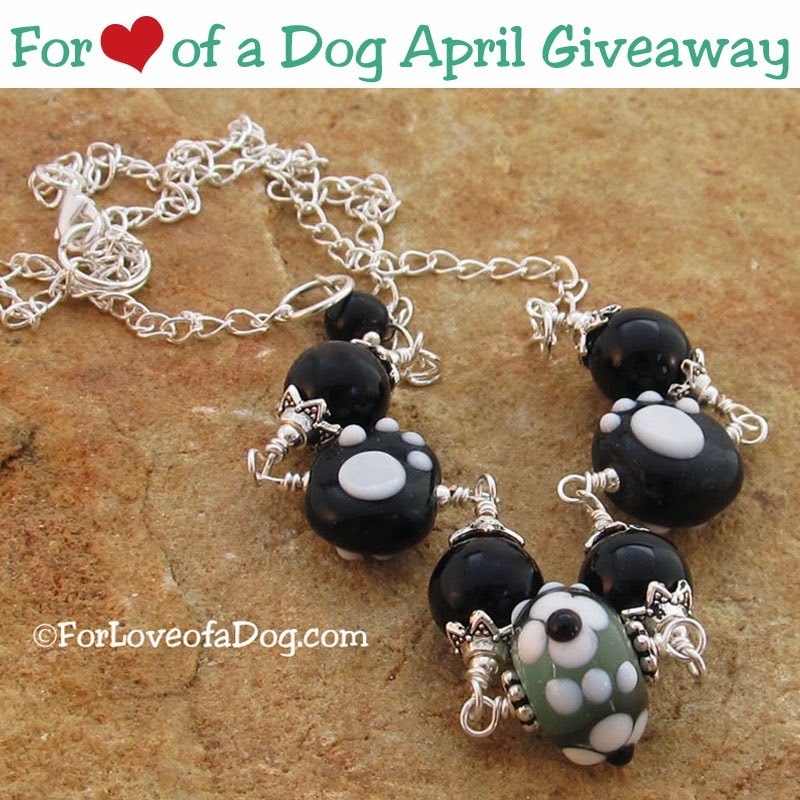 Paw Print Lampwork Necklace - For Love of a Dog Jewelry April Giveaway! Ended April 30, 2014. Congratulations to Gina and Oz! 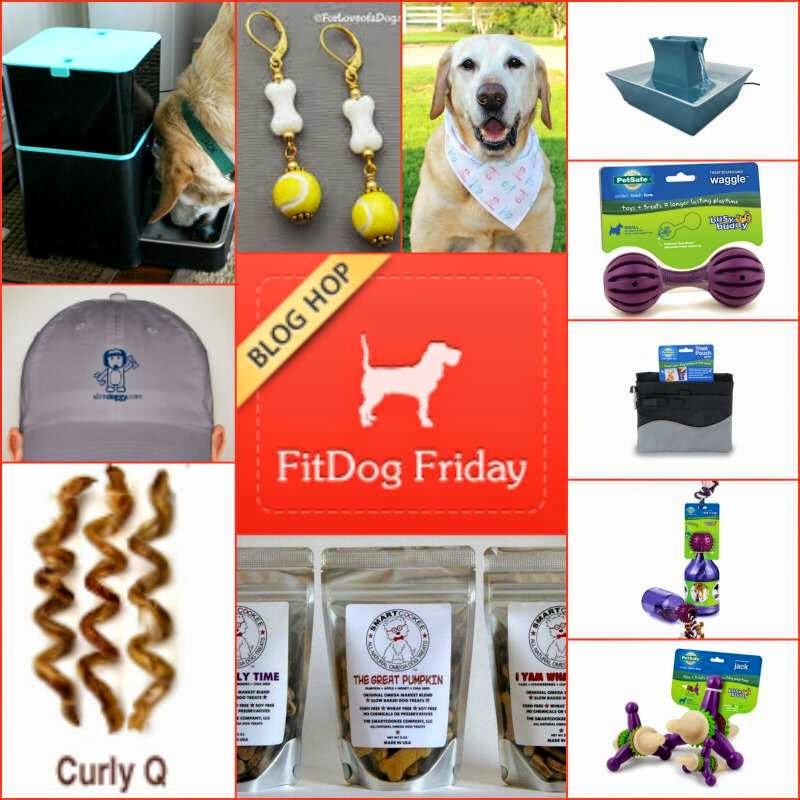 Pawsome giveaway prize package in celebration of Fit Dog Friday's anniversary! 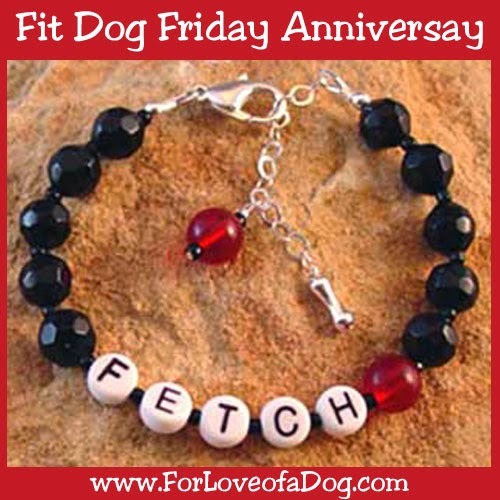 Including this FETCH Dog Lover Bracelet from For Love of a Dog. Ended. Congratulations to Angela! 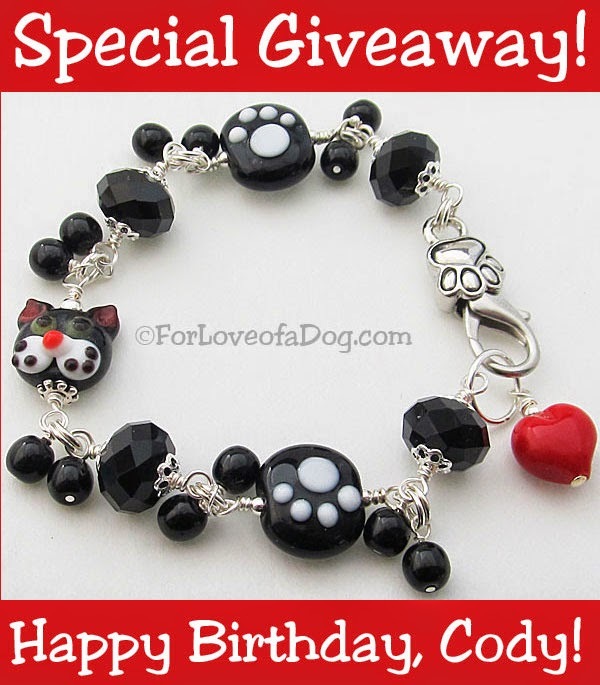 ENTER to WIN a Purrfect Paw Cat Lover Bracelet. 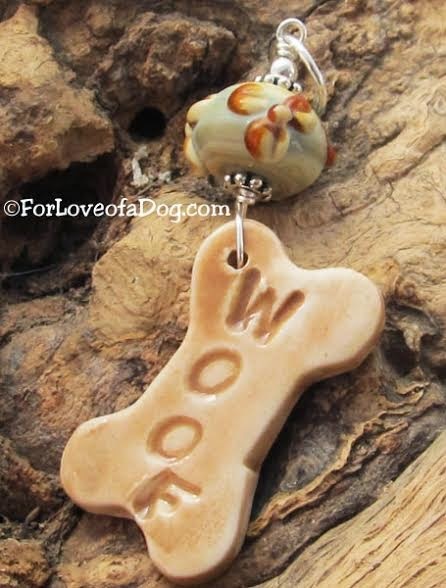 Handmade by For Love of a Dog Jewelry (that's me!) especially for our buddy, Cody's 7th birthday. A $75 value. Ended April 8, 2014 Congratulations to Kimberley! 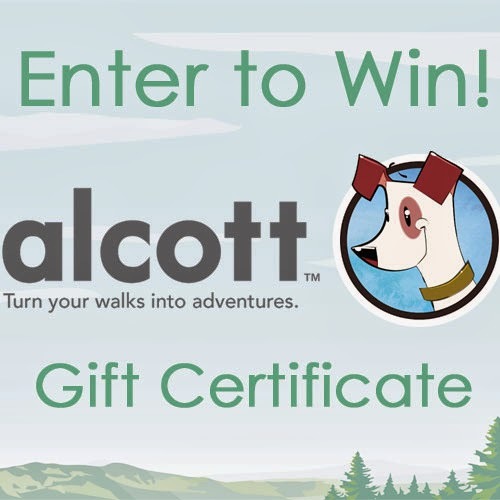 ENTER to WIN a $25 Alcott Gift Certificate from Alcott Adventures. Ended April 3, 2014. 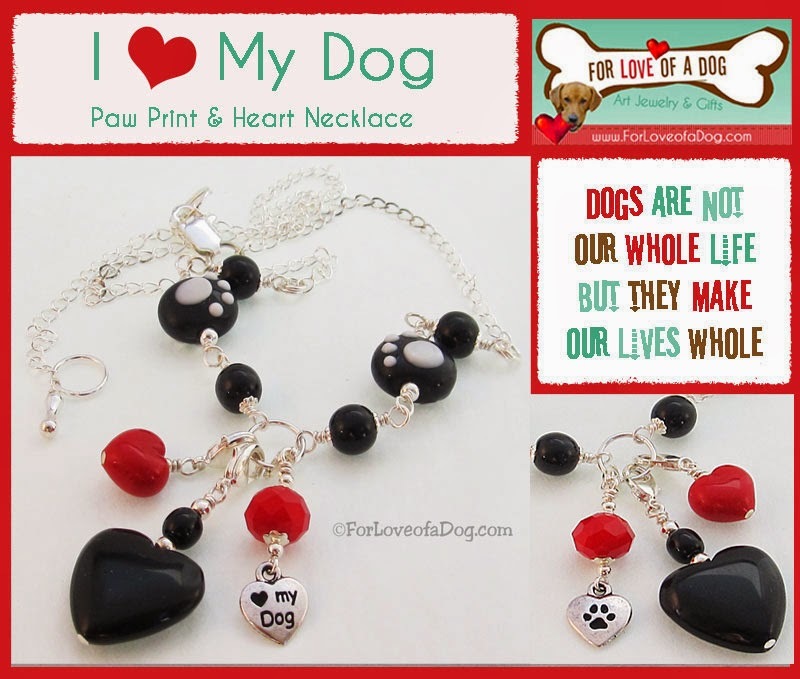 Congratulations to Vicki V.
ENTER TO WIN this I Love My Dog Necklace from For Love of a Dog Jewelry. Ended March 26, 2014 Congratulations to Christine! Love the charms on this one!